NOTE: I’m in process of finishing some commissioned work, as well as figuring out Ninjascript. This is an article draft I have been working on for a while, but I’m going to publish part of it now. Thanks for bearing with me during this time! In my years of market watching, I’ve come to believe that markets are more reactive in general, not proactive. It’s not traders that proactively initiate positions that move markets, it’s traders that are reactively exiting positions that move markets. This opens up a whole new way to think about price action. Proactive Trader–Has a plan or a strategy that outlines the conditions under which trading may occur; trades will not occur outside of these conditions. Waits for a piece of information, be it a price level, fundamental factor, news item, indicator or sentiment, and makes a valuation judgement based on that info; either the stock is too cheap or too expensive compared to where price should be in the future. Whether the timeframe is 10 seconds or 10 years is irrelevant–the fact is that the setup has occurred and the plan says the time is now. The trader goes to the market and trades, either entering or exiting a position. The key is that the trade is entered or exited according to an active mindset–they wilfully, intentionally CHOSE to act. I believe that proactive traders are profitable, winning traders, on average. Reactive Trader–Has no set plan. Goes to the market looking to put on a trade, any trade, and right now. Is forced to react to price, usually by emotions and impulses, or sometimes external factors like a margin call. Jumps into a trade due to fear of missing out, usually late in the move after they see “how much money they could have made”. Does not have a pre-determined profit target, and therefore will hang on to a trade out of greed until an adverse price movement forces them out, often at a loss. Reactive traders get lucky sometimes, but they are losing traders on average. It is true that the proactive trader is reacting to information in a way, but the proactive trader only reacts when market information matches the plans and setups that were previously defined. It is not his reactivity that defines the strategy nor the conditions under which the trade is taken though. I hope this point is clear. So the first step here is to operate from a proactive position and never from a reactive one if you want to succeed. Thankfully, human nature is what it is, and there will always be plenty of reactionary traders to transfer money into your accounts. The markets are made up of traders. You are not trading businesses or commodities or securities as much as you are trading other traders, especially over shorter timeframes like daytrading. I believe that the majority of traders are net losers on average. Because of this, there is substantial edge in taking the other side of a loser’s trade! The money flows from weak hands to strong hands, and from reacting traders to proactive traders. I should know; I’ve been the other side plenty of times. Now I want to study the losers so I can fade them. This includes studying my past mistakes as well as observing price action in general. 1. A trader / market maker with inventory purchased at a lower price who sees an opportunity to sell at higher prices. He may buy a small chunk at the market to then spin around and offer in size to the losing, stopped out traders. His catalyst buy may nudge the markets over the edge, but it’s the stops and panic of the losing shorts that applies buying pressure to the upmove. The winning trader is actually a net seller here, and is applying selling pressure that is opposed to the upmove! 2. The second person who will pay up is the reactive new long, mad that he missed the move up so far, and ready to chase a new high. He enters at a price which is usually adverse to his hoped-for trade direction, and if he is a weak hand, is about to become a loser after the shorts get done losing. On a sharp pullback, they will dump their long position, basically bailing at adverse prices because they are forced to by their stop or by their pain from the loss. 3. Longs from a higher order timeframe that are buying a breakout. A position trader from the daily or weekly timeframe is not a weak hand, and therefore will not typically be shaken out. But they also do not buy in size at a sinlge spot, so they won’t push prices much intraday. 4. Losing shorts that want to get out NOW, either by stop or by puking out their position. You can see from these examples that losers react to price, usually adverse price movements, while winners are proactively looking for their price. This is a draft of my trading plan. It’s not complete and is more of an outline than a finished document, but it gives you an idea of my thinking to this point. One trade setup is detailed–buying/selling the pivot point. If price does not come within my parameters, I’ll sit on my hands at this time. I would add other setups to the mix after being able to show a profit with this one. This trading strategy is designed to be used during range-bound market days, and the parameters below define the structure that I will operate in. Future setups will be intended to address other market environments. NOTE: Trade plan may only be changed outside of market hours! Trade plan will be followed when markets are open, or no trade. -Intraday only. No overnight holds. 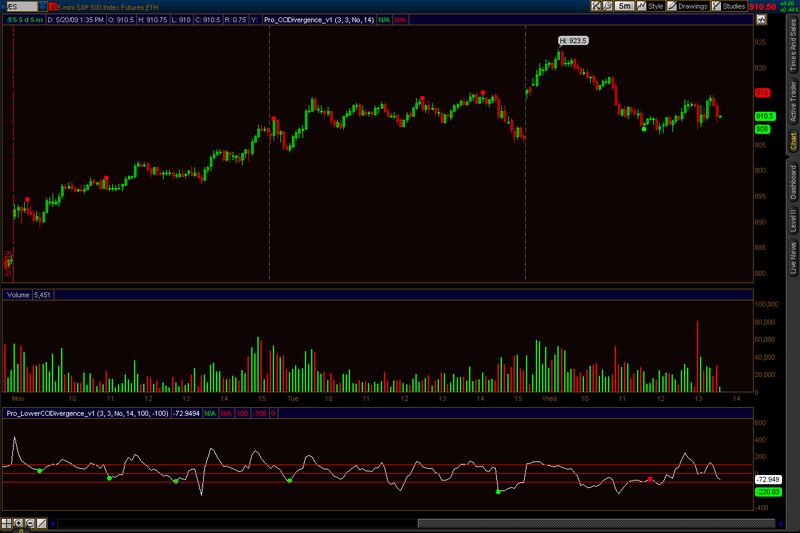 -Chart period: trades will be taken on a 5 min chart for ES and NQ. -Entry setup: Long at pivot point plus 1 tick if volatility based trailing stop is long-biased and lies below the pivot. -Entry setup: Short at pivot point minus 1 tick if volatility based trailing stop is short-biased and lies above the pivot. -Whichever is closer to market price. -Partial exit at TICK fade extreme (full exit if only 1 contract in position). Tick fade extreme is a bar where the TICK got beyond a threshold value of +/- 1000. -Add trade size: None currently. No adding to positions. There it is, a line in the sand. It’s imperfect and not optimal, but it’s something, which is better than the trading plan vapor-ware I have had up to now. Feel free to make suggestions or criticize it. If I can’t think of a good reason for why I wrote something, I probably wouldn’t want it in there anyway. I have discovered the Holy Grail. This is big. If you donate $1,000,000 I will send it to you. What the hell, I’ll give it away! I have had a change of heart. In lieu of donations, please send flowers to the freedom lovers at freethinkscript.blogspot.com. Plot that on your charts. IT. ALWAYS. SHOWS. THE. CLOSE. OF. THE. NEXT. BAR. IN. THE. FUTURE. Isn’t that worth $1,000,000? I would think so. Also, if you donate to my blog, all of your dreams will come true. True story.